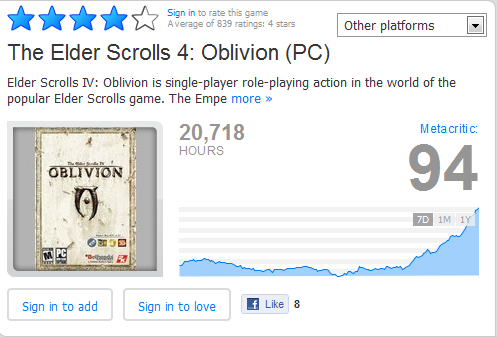 The game of the year edition of The Elder Scrolls 4: Oblivion went on sale this weekend via Steam for $8.50. It's a steal of a deal and I couldn't resist picking up a copy for myself. There is always a question of how successful these fire sales on Steam are. 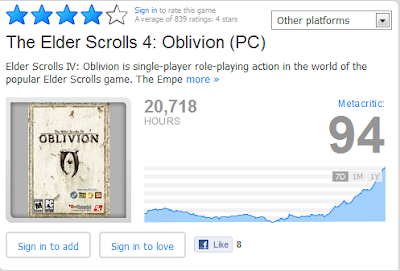 To provide some anecdotal evidence to their success, I present the previous 7-days of game-play tracking via Raptr for Oblivion. As can be seen, there is a pretty good spike following the start of the sale this weekend. While hours played are not easily equated to sales, and factoring in the sales price, it is tough to determine what revenue this generates for the game developer. However, a cursory glance tells us there are plenty of players playing the game and that has to warm the heart of any developer!